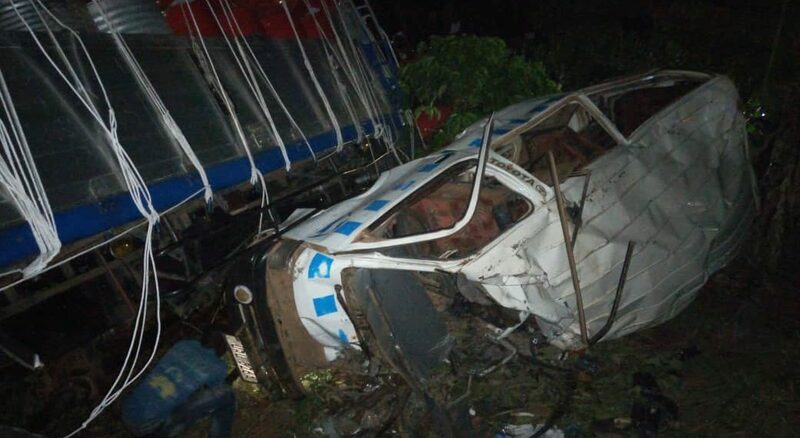 LUWEERO – Six people have been confirmed dead and 8 left with severe injuries in a fatal accident that happened at Lukomera village, Luweero Sub County on Kampala-Gulu Highway. The injured have been identified as Eric Ssempijja, Akram Bulaga, Sharon Nanyonjo, Tonny Kalyango, and Judith Akello. Others include; Brian Heresa, a student of Everest College in Luweero town and one only identified as Ntalo. Police say the six deceased have not yet been identified but police says the five are men and one female. Preliminary reports from police point to reckless driving as the possible cause of the accident. It is also alleged that the taxi was overtaking in a sharp bend when the accident happened. The Savannah Police Region spokesman, ASP Paul Kangave, said the injured eight people were taken to Bishop Asiri Hospital (Lachor) in Kasana- Luweero for treatment. The Luweero district police commander Byaruhanga Mworozi, said that the deceased persons are not yet identified. However, their bodies were taken to the mortuary at Luweero health centre IV.